John was born in Seville in 1478 to the sovereigns of Castile, Isabella I and Ferdinand V (also Ferdinand II of Aragon). At the time, his parents were involved in the War of Castilian Succession against Isabella's niece Joanna la Beltraneja, wife of King Afonso V of Portugal. John's birth helped consolidate Isabella's position as sovereign as she had given birth to a legitimate male heir. At the time of his birth, he had one elder sister Isabella; his younger sisters were Joanna, Maria, and Catherine. His parents won the war against the King and Queen of Portugal. To negotiate a peace settlement with Isabella, King Afonso sent Infanta Beatrice, Duchess of Viseu. The two women met in March 1479. Beatrice was Afonso's sister-in-law and Isabella’s maternal aunt. By terms of the treaty they eventually negotiated, the Queen of Portugal was given two options: she could either wed Prince John, waiting 13 or 14 years until the prince was old enough to be married (by which time Joanna herself would be at least thirty) or she could enter a convent; either way she was to give up her claim to the throne. Isabella I was quite an attentive mother for such a busy queen. John, being her only son, had a special place in her heart and she referred to him affectionately as ’my angel’ even when he was being reprimanded by her, John's wetnurse was Maria de Guzman, a member of the powerful Spanish House of Mendoza. It was commonly believed in the fifteenth century that a wetnurse could influence the character of the baby to whom she fed breast milk. Therefore, a healthy woman, with a placid disposition was ideal. John's paternal grandfather, King John II of Aragon, took close interest in the infant prince; he warned his son Ferdinand that the prince should not be tutored under one grandee, a member of the nobility, as they would have far too much influence over the boy. He also suggested that Prince John be educated in Aragon as opposed to Castile, which Isabella most likely rejected at once. In 1492, Columbus named the newly discovered island of Cuba as Isla Juana in deference to Prince John, at that time the heir apparent. Isabella and Ferdinand, together with their cousin, Duke Francis II of Brittany, planned the alliance of their respective heirs, John and Anne, but the plan came to nothing possibly due to John's frail constitution. Isabella and Ferdinand came to plan a double alliance with Maximilian I, Holy Roman Emperor, for the marriage of his children, Archduke Philip the Handsome and Archduchess Margaret of Austria. Around the same time, King Charles VIII of France invaded Italy and marched to take Naples which belonged to a branch of the House of Trastamara. Ferdinand II therefore was also against the French. With both powers angered at France, marriage was the way to seal the alliance between the two. 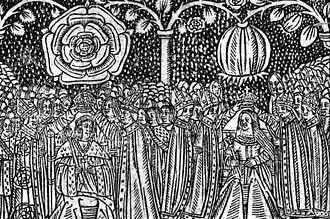 On 20 January 1495 in Antwerp, a preliminary alliance, which included a wedding of Prince John with Maximilian’s daughter was agreed. Similarly, Maximilian's son Philip and John's sister Joanna were to be married. Coat of arms of John, Prince of Asturias and Girona. As heir to the throne Isabella and Ferdinand paid special attention to John's education. His original tutor was the Dominican Fray Diego Deza who taught Theology at the University of Salamanca. Deza was also later remembered as the Grand Inquisitor of Spain, he taught the young Prince mainly in Theology as he was not a renaissance humanist. Eventually in the late 1480s, Isabella would ask the Italian humanist Peter Martyr d'Anghiera to come and broaden the Prince's education. Isabella also worried that John would grow up pampered and wilful if he lacked peers and companions of his own age. Therefore, she invited the sons of aristocrats to live at court. She also invited a slightly older group of young aristocrats so that her son would see older young men and that he would aspire to be more like them. Among these youths were young men who would later become famous in their own right, Nicolás de Ovando y Cáceres, the future governor of the Indies, and Gonzalo Fernández de Oviedo y Valdés the future historian of the Indies. John's education also insisted that he and his companions learned to ride and joust, to hawk and hunt, to play chess and cards, and to sing and recite poetry. John was also naturally gifted in music and was able to play the flute, violin, and the Clavichord with ease and great skill. He also developed a fine tenor voice and often sang with his siblings and companions at court. Infanta Joanna left Spain to marry Philip the Handsome in late 1496. Philip's sister, Margaret of Austria, aged 18, married John on April 3 the following year in Burgos Cathedral. It was a good marriage and John was devoted to Margaret. All of Isabella’s children had a passionate nature, and although it was a political alliance, it was a deep love match. Apparently the amount of time they spent in bed made the court physicians uneasy about the Prince's health. The lust he felt for his wife bothered him, but his confessor assured him it was natural. The Princess of Asturias was easy to love, she was fun loving and had a sharp sense of humor. Her first betrothal to Charles VIII ended when he rebuked her. Her engagement to the Prince of Asturias seemed doomed when the ship carrying her to Spain hit a storm in the Bay of Biscay. In haste, she wrote her own epitaph should she not reach Spain. Twice married - but a virgin when she died." On 4 October 1497, a messenger came to John's parents and informed them that their son lay dangerously ill in Salamanca. He and his wife Margaret had arrived a week earlier, on the way to the wedding of his older sister in Portugal. At once Ferdinand rushed to his son's bedside while Isabella remained behind fretting over the life of her only son. Ferdinand was with his son as John died in the arms of his former tutor Fray Diego Deza. He died possibly from tuberculosis, but rumors circulated John had died of sexual over-exertion at age eighteen. His dog, a lurcher called Bruto, had whimpered as he died, then stayed next to his coffin throughout the vigil in Salamanca’s main church. John's devastated mother would later keep the dog next to her, as if to keep the memory of her beloved son with her. Two months later, on December 8, the Princess of Asturias gave birth to their only child, a stillborn girl. John's death was followed closely by that of his sister Isabella in 1498. Her only child, Miguel de la Paz, died in 1500. The Spanish kingdoms passed to his younger sister Joanna, her husband Philip the Handsome, and their Habsburg descendants. Philip had himself and Joanna declared as 'Princes of Castile' which her parents took as a lack of respect towards his deceased brother in law. ^ Philippa was the daughter John of Gaunt, 1st Duke of Lancaster to his first wife Blanche of Lancaster, making her half-sister of Catherine of Aragon's maternal great-grandmother Catherine of Lancaster, daughter of John of Gaunt, 1st Duke of Lancaster to his second wife Constance of Castile. Wikimedia Commons has media related to John, Prince of Asturias. 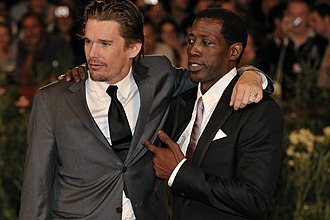 ^ a b Chisholm, Hugh, ed. (1911). "Ferdinand V. of Castile and Leon and II. of Aragon" . Encyclopædia Britannica. 10 (11th ed.). Cambridge University Press. ^ a b c d Ortega Gato, Esteban (1999). "Los Enríquez, Almirantes de Castilla" [The Enríquezes, Admirals of Castille] (PDF). Publicaciones de la Institución "Tello Téllez de Meneses" (in Spanish). 70: 42. ISSN 0210-7317. ^ a b c Lee, Sidney, ed. (1896). "Philippa of Lancaster" . Dictionary of National Biography. 45. London: Smith, Elder & Co. p. 167. ^ a b c Gerli, E. Michael; Armistead, Samuel G. (2003). Medieval Iberia. Taylor & Francis. p. 182. ISBN 9780415939188. Retrieved 17 May 2018. ^ a b Miron, E. L. (1913). "Doña Leonor of Alburquerque". The Queens of Aragon: Their Lives and Times. Brentano's. p. 265. Retrieved 21 August 2018. ^ a b Leese, Thelma Anna, Blood royal: issue of the kings and queens of medieval England, 1066–1399, (Heritage Books Inc., 1996), 222. ^ Armitage-Smith, Sydney (1905). John of Gaunt: King of Castile and Leon, Duke of Aquitaine and Lancaster, Earl of Derby, Lincoln, and Leicester, Seneschal of England. Charles Scribner's Sons. p. 77. Retrieved 17 May 2018. John of Gaunt, 1st Duke of Lancaster, KG was a member of the House of Plantagenet, the third of five surviving sons of King Edward III of England and Philippa of Hainault. He was called John of Gaunt because he was born in Ghent, when he became unpopular in life, scurrilous rumours and lampoons circulated that he was actually the son of a Ghent butcher, perhaps because Edward III was not present at the birth. This story always drove him to fury, due to some generous land grants, John was one of the richest men in his era. John of Gaunts legitimate male heirs, the Lancasters, include Kings Henry IV, Henry V and his other legitimate descendants include his daughters Queen Philippa of Portugal and Elizabeth, Duchess of Exeter, and Queen Catherine of Castile. 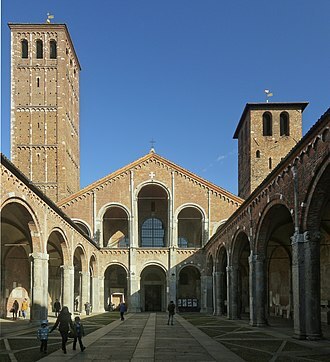 John fathered five children outside marriage, one early in life by a lady-in-waiting to his mother, the children of Katherine Swynford, surnamed Beaufort, were legitimised by royal and papal decrees after John and Katherine married in 1396. Through his daughter Philippa, he was grandfather of King Edward of Portugal, through John II of Castiles great-granddaughter Joanna the Mad, John of Gaunt is an ancestor of the Habsburg rulers who would reign in Spain and much of central Europe. When John of Gaunt died in 1399, his estates and titles were declared forfeit to the crown, since King Richard II had named Henry a traitor, Henry Bolingbroke returned from exile to reclaim his inheritance and depose Richard. Bolingbroke reigned as King Henry IV of England, the first of the descendants of John of Gaunt to hold the throne of England, John was the fourth son of King Edward III of England. His first wife, Blanche of Lancaster, was his third cousin and they married in 1359 at Reading Abbey as a part of the efforts of Edward III to arrange matches for his sons with wealthy heiresses. He became the 14th Baron of Halton and 11th Lord of Bowland, John inherited the rest of the Lancaster property when Blanches sister Maud, Countess of Leicester, died without issue on 10 April 1362. John received the title Duke of Lancaster from his father on 13 November 1362, by well established, he owned at least thirty castles and estates across England and France and maintained a household comparable in scale and organisation to that of a monarch. He owned land in almost every county in England, a patrimony that produced a net income of between £8,000 and £10,000 a year, Johns ascendancy to political power coincided with widespread resentment of his influence. Although he fought in the Battle of Nájera, for example, when Edward III died in 1377 and Johns ten-year-old nephew succeeded as Richard II of England, Johns influence strengthened. However, mistrust remained, and some suspected him of wanting to seize the throne himself, John took pains to ensure that he never became associated with the opposition to Richards kingship. As de facto ruler during Richards minority, he made unwise decisions on taxation that led to the Peasants Revolt in 1381, when the rebels destroyed his home in London, the Savoy Palace. Diego de Deza was a theologian and inquisitor of Spain. He was one of the notable figures in the Spanish Inquisition. Deza was born in Toro and entered the Dominican Order at a young age. He held a number of posts, and tutored Prince Juan de Aragón y Castilla, known as John, Prince of Asturias. He was fundamental in granting navigator Christopher Columbus access to Queen Isabella, after first serving as Bishop of Zamora, Bishop of Salamanca, Bishop of Jaén, and Bishop of Palencia, he became Archbishop of Seville in 1505. Deza was commissioned as Grand Inquisitor for Castile, León, on 1 September of the following year, his authority was expanded to cover the whole of Spain. Deza was the successor to Tomás de Torquemada, perhaps the most famous of all inquisitors, like Torquemada, Deza had a particular dislike of conversos — Jews or Muslims who had converted to Christianity but who were often accused of secretly retaining their original faith. 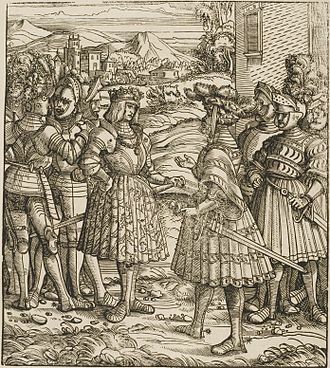 It is reported shortly after his arrival to Palencia, he managed, on 25 April 1500. As the 25 April was Saint Marcus day according to the calendar and he was commissioned as Archbishop of Seville on 30 October 1504. Arriving in Seville in October 1505, just one year after his appointment, with the help of Martín de Ullate, numerous Sevillian Muslims and Jews were thus converted no than the end of 1505. He held the inquisitorial enquiries on the new Archbishopric of Granada, like Torquemada, Deza was accused of being overzealous in his work, and of showing excessive cruelty – his reputation was sufficient that in 1507, the Pope was forced to publicly request moderation. Accusations were made that Deza used his position to enrich himself, Deza himself was accused of secretly practicing Judaism, a charge mainly based on the fact that he himself had Jewish blood on his mothers side. The accusation was probably political, but nevertheless damaged his standing somewhat and his position was further undermined by several open insurrections against the Inquisition, particularly against his chief lieutenant Diego Rodriguez Lucero. Henry III of Castile, called the Mourner, was the son of John I and Eleanor of Aragon. He succeeded his father as King of Castile in 1390, Henry was born in Burgos, the capital of Castile. He was the child of the recently crowned king John I of Castile. His younger brother Ferdinand grew up to king of Aragon. His upbringing was entrusted to Inés Lasso de la Vega, the wife of John Niño, as a child he was educated by Diego de Anaya Maldonado, Bishop of Tui-Vigo, who became Archbishop of Seville. His tutor was Juan Hurtado de Mendoza el Limpio and his confessor was the Dominican Alonso de Cusanza, shortly after his birth, he was promised to be married to Beatrice of Portugal, the heir to the Portuguese throne. This was part of a treaty between Castile and Portugal, who had signed a truce after the Ferdinand Wars. But this marriage did not happen, Beatrice married his father, who would instigate a war of succession with John of Aviz. In 1388, as part of the Treaty of Bayonne, he married Catherine of Lancaster in Palencia Cathedral and she was the daughter of John of Gaunt, the Duke of Lancaster, and Constance of Castile, a daughter of Peter the Cruel. 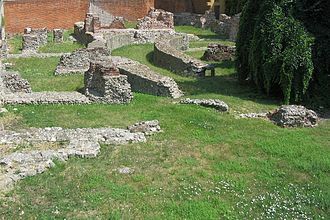 This solved the conflict that had raged since the death of Peter the Cruel, secured the House of Trastámara. At the time of his wedding, he received the title Prince of Asturias with the approval of the court of Briviesca and this title designated him as the heir apparent. He was the first person to hold this title, with earlier heirs to the throne being known as infantes mayores, in 1390, his father considered abdicating in his favour to gain the recognition of the Portuguese, but he was dissuaded from this plan by his council. They were against it because of the damage caused to the kingdom by earlier similar decisions, however, in October of the same year, King John died in Alcalá de Henares by falling off his horse, and Henry was proclaimed king. He assumed power on 2 August 1393, at the age of 13, despite his nickname, he engaged in a vigorous foreign policy and manoeuvres during the first few years of the 15th century. He was able to pacify the nobility and restore royal power and he was supported by the aristocracy and displaced their most powerful relatives. The University of Salamanca is a Spanish higher education institution, located in the town of Salamanca, west of Madrid, in the autonomous community of Castile and León. It was founded in 1134 and given the Royal charter of foundation by King Alfonso IX in 1218 and it is the oldest founded university in Spain and the third oldest university in the world in continuous operations. The formal title of University was granted by King Alfonso X in 1254 and its origin, like all older universities, was a Cathedral School, whose existence can be traced back to 1130. The university was founded in 1134 and recognized as a General School of the Kingdom by the Leonese King Alfonso IX in 1218, granted Royal Chart by King Alfonso X, dated 8 May 1254, as the University of Salamanca this established the rules for organization and financial endowment. On the basis of a bull by Alexander IV in 1255, which confirmed the Royal Charter of Alfonso X. The historical phrases Quod natura non dat, Salmantica non praestat, in the reign of King Ferdinand II of Aragon and Queen Isabella I of Castile, the Spanish government was revamped. Contemporary with the Spanish Inquisition, the expulsion of the Jews and Muslims, and this involved the massive employment of letrados, i. e. bureaucrats and lawyers, who were licenciados, particularly, of Salamanca, and the newly founded University of Alcalá. While Columbus was lobbying the King and Queen for a contract to seek out a route to the Indies. In the next century, the morality of colonization in the Indies was debated by the School of Salamanca, along with questions of economics, philosophy, by the end of the Spanish Golden Age, the quality of academics in Spanish universities declined. The frequency of the awarding of degrees dropped, the range of studies shrank, the centuries-old European wide prestige of Salamanca declined. Like Oxford and Cambridge, Salamanca had a number of colleges and these were founded as charitable institutions to enable poor scholars to attend the University. By the eighteenth century they had become closed corporations controlled by the families of their founders, most were destroyed by Napoleons troops. John II of Castile was King of Castile and León from 1406 to 1454. John was the son of King Henry III and his wife and his mother was the granddaughter of King Peter, who was ousted by Henry IIIs grandfather, King Henry II. John succeeded his father on 25 December 1406, and united in his person the claims of both Peter and Henry II and his mother and his uncle, King Ferdinand I of Aragon, were co-regents during his minority. When Ferdinand died in 1416, his mother governed alone until her death in 1418, John IIs reign, lasting 49 years, was one of the longest in Castilian history, but John himself was not a particularly capable monarch. He spent his time verse-making and holding tournaments and his favourite, Álvaro de Luna, heavily influenced him until his second wife, Isabella of Portugal, obtained control of his feeble will. 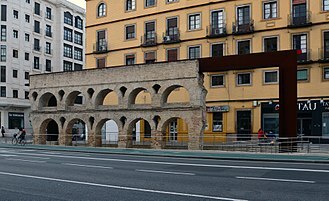 At her instigation, he dismissed his faithful and able servant, John IIs Regents declared the Valladolid laws in 1411, which restricted the social activity of Jews. Among the most notable of the provisions were outlining that Jews must wear distinctive clothes, in 1431 John placed Yusuf IV on the throne as the Sultan of Granada in the Moorish Emirate of Granada, in exchange for tribute and vassal status to Castile. Plateresque façade of the University of Salamanca. Founded in 1812, S.A. Mirat, is claimed to be the city's oldest industrial business. 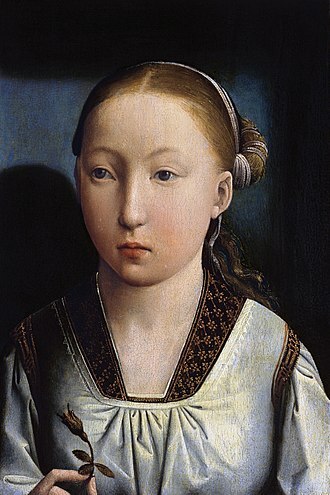 Portrait by Juan de Flandes thought to be of 11-year-old Catherine. 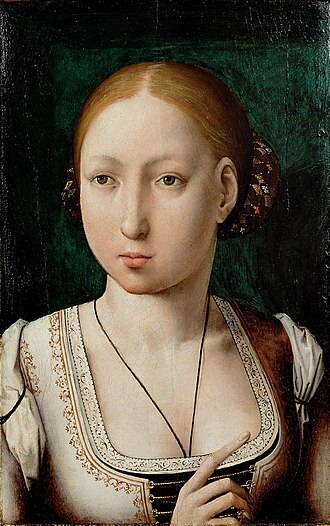 She resembles her sister Joanna of Castile. 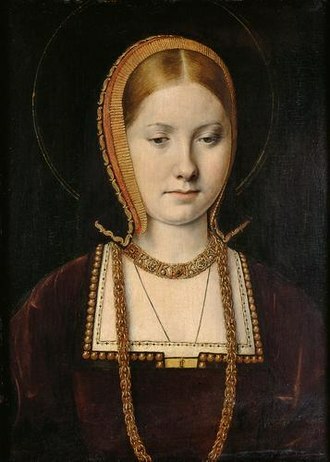 Portrait of a noblewoman, possibly Mary Tudor c. 1514 or Catherine of Aragon c. 1502, by Michael Sittow. Kunsthistorisches Museum, Vienna. Treaty made signed on Anne's behalf with the Kingdom of England on 15 February 1490. The signing is autograph and also contains the personal seal of the Duchess. Archives nationales, France, AE/II/525. Waxwork reenactment from the marriage of Duchess Anne of Brittany and King Charles VIII of France in the "marriage hall" of the Château de Langeais. Medal of Queen Anne made in celebration of her stay at Lyon in 1499. Reliquary of Anne of Brittany's heart. 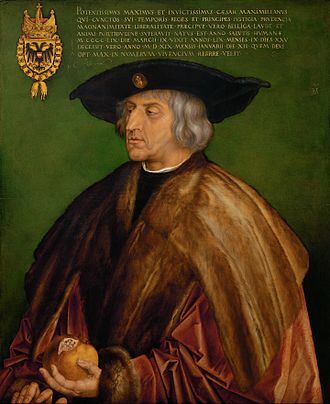 Maximilian personally led his troops at the battle of Wenzenbach in 1504. The tomb of Gaunt and Blanche of Lancaster in St. Paul's Cathedral, as represented in an etching of 1658 by Wenceslaus Hollar. The etching includes a number of inaccuracies, for example in not showing the couple with joined hands. Statue of Gonzalo Fernández de Oviedo at the Ozama Fortress courtyard in Santo Domingo Colonial City, Dominican Republic. The tomb of Henry III of Castile. Chapel of the New Monarchs of Toledo.